Apple’s new iPad may be small but there’s nothing mini about its advertising campaign, with the tech company rolling out not one, not even two, but three ads featuring the new device. The first is short and sweet, running for just 30 seconds. It starts out with someone playing the opening notes to Hoagy Carmichael’s Heart and Soul with two fingers using a piano app on a full-size iPad. The new Mini then slides into view with the same piano keyboard displayed on the screen, whereupon a duet commences, with the iPad Mini pianist using one finger to play along. And that’s it. The short skit gives consumers a clear idea of how much smaller the new iPad is, while planting the idea that anything you can do on the big one, you can also do on the small one. The second ad also runs for about half a minute and focuses on the iPad Mini’s new Smart Cover, protecting the screen from damage while adding a splash of color to the device. Incidentally, this Smart Cover is without the aluminum hinge found on with the iPad’s Smart Cover. 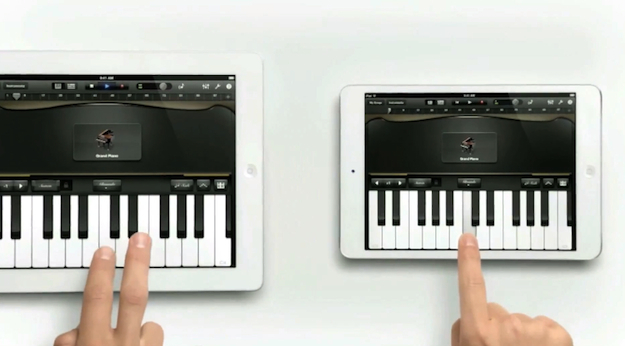 Again, the ad is simple and slick, with a piano-based soundtrack, lots of iPad Minis and Smart Covers, and no voiceover. Finally, there’s the full-on, look-what-we-have-here, meat-and-bones ad, coming in at just under five minutes. It’s in Apple’s familiar style, you know the type – white, brightly lit sets, talking heads, and a number of inserts showing the new product in everyday use. Now Tim Cook and his team just have to wait and see if anyone buys it….